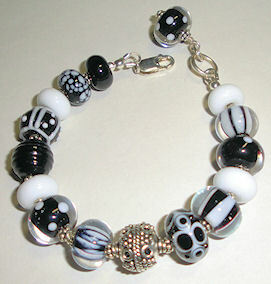 I decided to make a bracelet to go with the black and white necklace. I thought I didn’t have enough beads for it and was going to make more later but I decided to see if I could make it work. Since I wanted to use smaller beads for the bracelet, I ended up using more plain spacer beads so it worked out.